Contributed by | Schmalz, Inc. In automation technology, visualization of the relevant process data is becoming more and more important. Users require reliable information on the safety of facilities and individual components. This is necessary for resolving faults and carrying out precautionary maintenance, for example. That is why, for years, vacuum specialist Schmalz has been pressing ahead with integrated communications from gripping system components all the way up to the management level. Now the company is taking the next step. Near-field communication (NFC) protocols allow data from intelligent vacuum components to be read directly from the processor of a device to a mobile end device, opening up totally new opportunities for optimizing production processes. IO-Link and NFC visualize information on device and process for management, commissioning engineers and maintenance engineers. “Our intelligent devices, termed Smart Field Devices, have been capable of making available important process data for some time now. 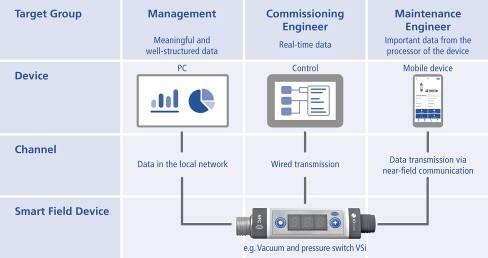 Features such as energy monitoring, condition monitoring and predictive maintenance have become established in the market and have very useful applications (in vacuum generators, for example) for the automotive industry and others,” says Walter Dunkmann, business development process manager for vacuum components at Schmalz. The company equips devices such as the SCPSi compact ejector and the SNGi-AE needle gripper with I/O links necessary for transmitting the data acquired at the field level up to the control, process, management and company levels. The future envisioned in the “Internet of Things” and “Industry 4.0” has already arrived for the automation segment, where increasing flexibility and network integration is the order of the day. “Now those responsible for managing or commissioning a facility have at their disposal all the information they need to make any necessary interventions in the process,” explains Dunkmann. Vacuum components such as the VSi vacuum and pressure switch from Schmalz are becoming central to the gripping process. Right at the workpiece they gather data, interpret it, and provide it on the network. An automation cloud takes over the role conventionally played by an automation pyramid of hierarchical communication. And now by transmitting the data to mobile end devices, Schmalz is opening a new data channel. Suddenly it’s not just the commissioning engineer or the management who is capable of accessing the data. In a matter of seconds, without any extra cables or power supplies, maintenance engineers now have access to all the data they need, in a user-friendly display format, directly on their smartphones or tablets—devices that have already been in common private use for some time. Schmalz uses NFC for data transmission. “In this context, NFC can be likened to a bus that takes data from point A to point B and back,” says Walter Dunkmann. Near Field Communication is an international standard for exchanging data between different devices over short distances. The most commonly known application is the mobile payment solution that Apple has been pushing ahead mainly in the USA, but that will soon come to Germany as well. Components with this technology are equipped with a tag on which all the data is saved. Schmalz components have a distinctive feature: Via NFC, the data is read directly from the processor of the component—a first in industrial manufacturing. When the user holds an enabled smartphone within two centimeters of the device, a connection is established automatically. Current is induced in a coil and provides power for a processor to transmit its information with an antenna. This exchange requires no extra power source. The energy required is supplied by the smartphone. Due to the short transmission range, there is no risk of incorrect parameterization of a neighboring device. The NFC tag in the phone links to a webpage; no separate app is required on the end device for displaying the data. And with NFC it is also possible, to parametrize devices via smartphone or tablet pc. Thus the user can quickly and easily access useful data such as serial numbers, process settings, switching points, and operating instructions, and has the industrial world at their fingertips. NFC promotes transparency. “Since the data is now visible to the maintainer, too, the usefulness of the system is manifold,” Walter Dunkmann points out. For example: A press in an automotive plant stops working, and the controls stop receiving signals. Because of the high downtime costs, the maintenance engineer is under immense pressure. First, they have to visually inspect the condition of the installed vacuum switches. They have to consult the operating instructions about potential faults, causes and solutions. If a switch is not equipped with a display, then the only option is to check the voltage at every switch, costing an enormous amount of time. 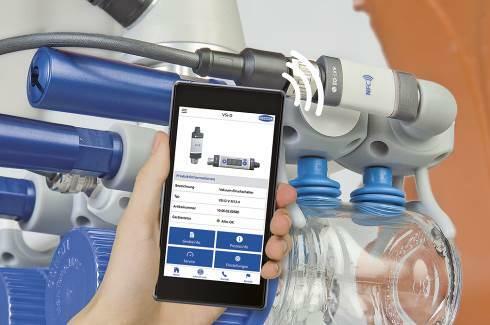 Now, thanks to NFC, maintenance engineers can inspect the status of every component directly. If there is a fault, a report is written out on the display, such as “insufficient power supply”. In addition, the employee is given information on the fault, potential causes, and troubleshooting measures. In this manner, fault diagnostics and repair are made substantially easier, saving time and—especially—money. After all, plant downtime incurs extremely high costs. The VS/VSi vacuum and pressure switches give the user easy access to service and maintenance information such as type, serial number, and operating instructions via their smartphone or tablet. Installation of new vacuum switches is another scenario. Until now, the commissioning engineer had to open the packaging and read the product label for identification. Next came consulting the operating instructions for the technical specifications and working areas. Finally, the switches were installed and the switching points were set for all the devices using the operating keys—a time-consuming process. Using NFC, the user can inspect the technical specifications of the new switch, set its parameters, and transfer the settings to other switches in a matter of seconds.